Know a friend who drives? Get them to start Hitching! Get $20 worth of Grab Promo Codes for every friend you successfully refer to sign up as a Hitch driver AND your friend will get $20 in his/her Hitch driver wallet too! All your friend has to do is to complete ONE ride by 12:00hrs on 31st May 2017 and BOTH of you will qualify for your respective incentives. Remember to also RATE YOUR HITCH DRIVER after every GrabHitch Ride! Referring your friend takes less than 5 minutes! 1. Get YOUR FRIEND to open the GrabHitch tab on the GRAB App. 2. Click on the Drive with Hitch Button and upload the necessary information. 3. Make sure YOUR Grab-registered mobile number (include 65 in front e.g. 65xxxxxxxx) is included in the Referral Code field (see screenshot). Remember to encourage your friend to do a ride by 31st May 2017 so that both of you qualify for your rewards! Please click here for more information about our April PRD. The $20 promo code for referrer / $20 credit for referred scheme runs from 1st May 2017 @ 00:00 hours – 31st May 2017 @ 12:00 hours. Passengers have to ensure that the driver they refer signs up with the Passenger’s mobile number (include 65 in front e.g. 6512345678) OR the passenger’s unique referral code to qualify as a valid referral. Passengers will only receive their $20 worth of Grab Promo Codes if their referred friend successfully completes ONE GrabHitch ride as a driver by 12:00hrs on 31st May 2017. After the referred driver has completed his/her ride as a driver, please allow up to 10 working days after the incentive period has ended (ie. post-31st May 2017) for the $20 in Grab Promo Code to be processed and for the $20 Shell Petrol Voucher (if eligible) to be mailed to you. The $20 worth of Grab Promo Code incentive received from this scheme can only be utilised for GrabCar or GrabTaxi rides within Singapore. 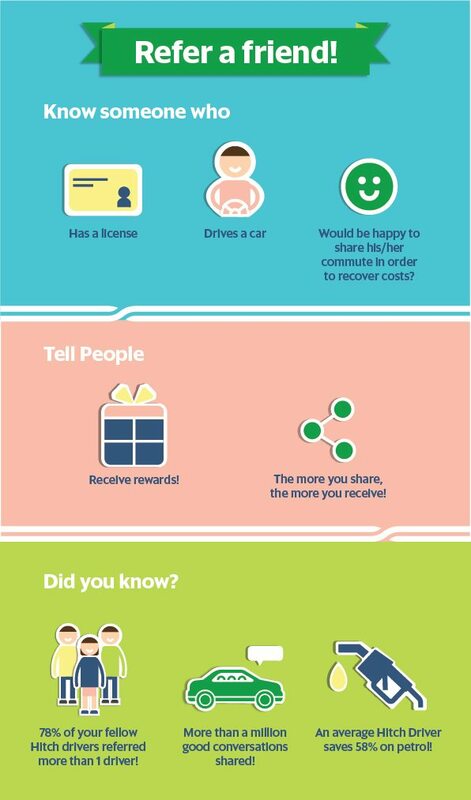 Passengers can refer multiple drivers to get more rewards, so if you refer 3 drivers who all do 1 ride each, you’ll get $60 in Grab promo codes! Each passenger will only be entitled to ONE $20 Shell Petrol voucher for 3 or more successful referrals. 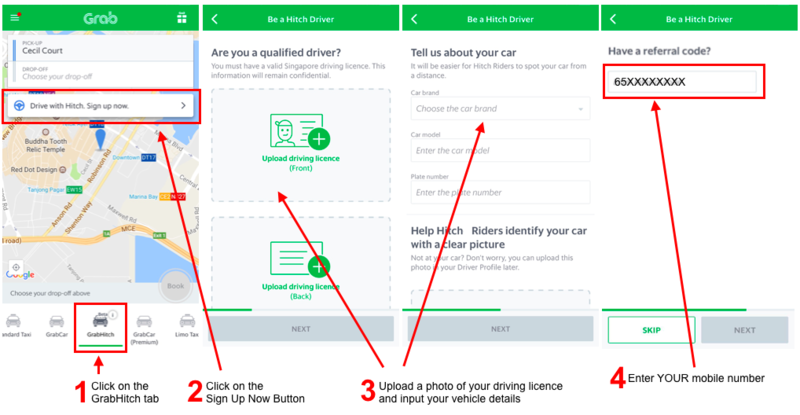 Drivers have to sign up with the Passenger’s mobile number (include 65 in front e.g. 6512345678) OR the passenger’s unique referral code and do ONE successful GrabHitch ride as a driver by 12:00hrs on 31st Mayl 2017 to count as a successful referral. After completing your 1 GrabHitch ride, please allow up to 10 working days after the incentive period has ended (ie. post-31st May 2017) for the $20 credit to be transferred into your GrabHitch driver wallet.